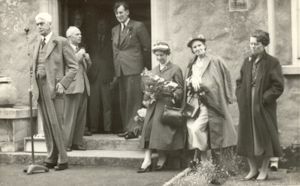 This photo was taken on 7th June 1958, when W S Morrison, our MP and Speaker of the House of Commons, came to open the Parents' Association Fete. Behind him is A L Horne, Chairman of the Governors, and A L Jones, the Headmaster. I am on the far right, next to Mrs Horne and Mrs Morrison. 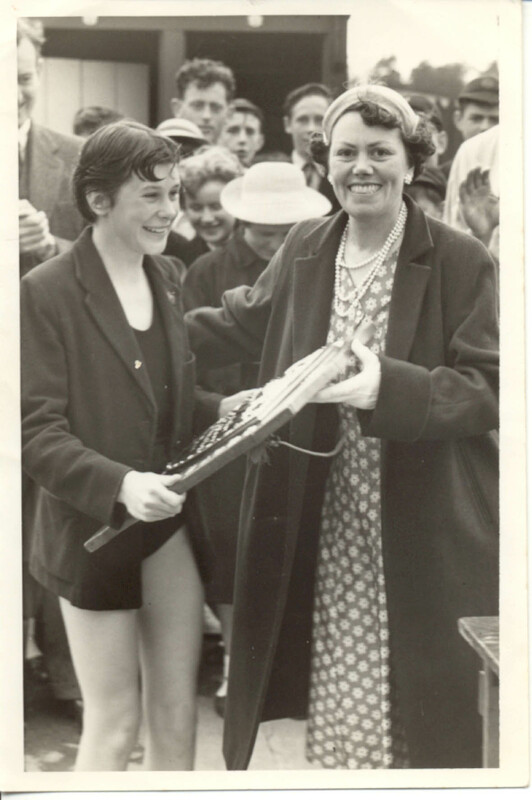 I was asked to present the prizes for the 1957 Swimming Sports: Liz Reeve was, I think, the youngest winner of the Girls' Shield. In 1954, we set up the Parents’ Association to support developments at the School. Rex Morris, local bookseller, was the Chairman and I was the Secretary. We organised fund-raising events and the most important was the annual October Fair. These raised quite a lot of money and enabled the swimming pool to be built and the Library created from one of the classrooms, freeing up the big room in the Old School for art lessons. Our fund-raising events took a lot of time to organise but there was good support from parents and the rest of the community. I can’t remember when the Parents’ Association closed down.